I’m serious about being dead. “The Good Wife” on CBS is a terrific show. I watched the first couple of seasons, then drifted away to only watch sporadically since. 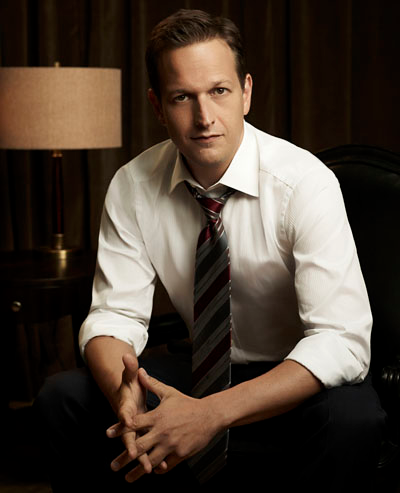 I have caught a few sensational episodes this season, including the bombshell a few weeks ago that killed off main character Will Gardner, played by Josh Charles. First of all, this makes me an even bigger fan of the talented Charles. He’s deftly emotive onscreen, convincing in swift turns as powerful, passionate and playful. And although I haven’t followed him on Twitter before today, I’ve heard he’s genuine and enthusiastic in connecting with fans there. This all also reminds me why, through all of the clutter and self-indulgent blather of social media, Twitter and other sites can connect us in such remarkably personal ways we couldn’t have conceived of even a few years ago. I appreciate how Charles recognizes exactly that very real emotional connection the audience forms with characters, especially ones drawn with such depth and passion and spirit as Gardner on “The Good Wife.” From him the phone call seems like a completely earnest, heartfelt gesture, not a self-serving gimmick. To be a little more corny, it seems like something that could be part of Charles’ own process of mourning a character he has invested so much in over five seasons. This blurred line of our reality and our dramatic entertainment fantasy is astonishingly cool–Will Gardner reached out from beyond the grave to directly console an emotionally despondent fan. That’s just cool. But some apps linking music or feeds with social media make sense. I am tinkering with feed pages to try to organize the 6,000 daily news and content resources I jam into my cluttered skull. I was checking out NetVibes.com, which lets you set up and customize pages and tabs with stuff from sites you’re interested in. NetVibes.com will receive the following info: your public profile, friends list, News Feed and likes. Uh, ok, sure. NetVibes will need access to my public profile and feed to share them in the widget. Friends list and likes…not sure but seems harmless and unintrusive enough. Go. Netvibes.com would like to post to Facebook for you. Ugh, really? Like the way I get continuous updates that Kelli is listening to Cyndi Lauper on Spotify? Now you’ll be able to notify friends that “Doug just created an RSS Feed of ‘Cats Eating Pudding’ on NetVibes”? Oh good grief, fine. Next. Netvibes.com would like to manage your Pages. What? Why is this even a consideration? Would NetVibes.com also like access to my Gmail and my checking accounts? I actually turn down any app request that asks for permission to post on my behalf. But this is excessively ridiculous and doesn’t make any sense to serve the user or Netvibes.com. Seems providers would do better to offer the least intrusive options that encouraged the most people to use their services. If all the widgets on NetVibes.com are this invasive, I’ll look for another option.